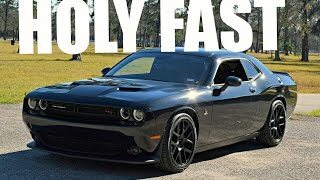 Dodge is there with its new model Dodge Challenger 2015 which is building tremendous sales momentum with the s1ccess of its previous Challenger Model. It is based on the 1971 model, which inspired its facelift. But, there are no engine updates which will disappoint the market. Let us have a close look at the reviews of the Dodge Challenger 2015 and get to know about the features it holds. Dodge Challenger 2015 comes with the new features in the interior enhancing its level in the competitive market. The center console joins a reshaped, driver-focused instrument panel. There is a upscale cabin with polished aluminum inserts and leather-wrapped surfaces and more high-tech with an updated 8.4-inch infotainment system and a 7-inch TFT instrument cluster screen in sight. New steering wheel is introduced with better grips for hands and the front seats come with the redesigned side bolsters and improved cushioning.It is done with the premium cloth or Nappa leather with Alcantara suede, while a newly-introduced option allow allows for a heated and ventilated, Nappa leather combo. These entire features provide the new Challenger with classy interior. The exterior of Dodge Challenger 2015 comes with the inspiration from the 1971 model. This old model inspired the facelift of the Challenger 2015 that includes a split front grille, separate taillights and a more pronounced power bulge hood. In the front the chrome accented grille is now flanked by LED halo headlamps, while the bumper features a larger trapezoidal intake that’s been mounted upside down compared to the previous model. In addition it provides with the features that include thinner and longer turn signals, and fog lamps fitted with black bezels. The rear end includes the new separate taillights with a glossy black background, which is also reminiscent of the 1971 Challenger. There is a reshaped bumper and slightly larger trunk lid spoiler. Also, the fit and finish of Dodge Challenger 2015 seems more modern look. Dodge Challenger 2015 comes powered with the 3.6 L V-6 engines. The transmission includes the six- speed manual. The powerful engine provides the 305 horsepower and offers the torque of 368 nm. It is capable of knocking the sprint of 0-60mph in 6.5 seconds with the top speed 182mph.